South Australia, the 2014 election and who is Gerry Mander anyway? People are scratching their heads about why the Liberal party has ended up with more of the votes in 2014 South Australian election but doesn’t seem to have won the election outright. And it’s not the first time this has happened. Labor won the 2010 election despite having only 48.4% of two party preferred votes and ended up with 26 seats while the Liberals got 18 and three seats were won by Independents. How can this have happened, should I storm the Bastille, put down the collar of my Crows polo top and march down Rundle Mall smashing frog cakes against the Malls Balls? Shut up! I don’t even know if Balfours Bake Cafe is open on Sundays. Democracy, what have you done to us? First of all, let’s all pause to reflect on why Gerrymandering is called that. 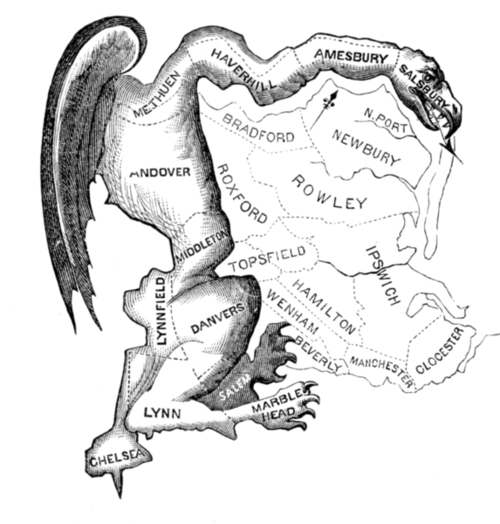 It’s because when the Massachusetts state senate election districts were redrawn in 1812 by the then-governor Elbridge Gerry, he skewed them to favour certain candidates and the shape in which he drew the boundaries for one of the districts was likened to a salamander by one of the papers. Here’s the cartoon the paper drew at the time: Inventive, isn’t it? Where are you on this one, Advertiser? Anyhoot, flash forward a couple of hundred years and people are getting fired up about South Australia’s 2012 redistribution. Did the Electoral Commission paint a salamander over the state of South Australia or not? When making a redistribution, the Electoral Districts Boundaries Commission must ensure that the determination is based on the principle of one vote, one value. That is,the number of electors within each House of Assembly district is approximately the same, within a threshold on plus or minus 10% of the quota. At the 2012 redistribution, the Electoral Commission didn’t redistribute in a manner that would have delivered Liberal the 2010 election. It stuck largely to the existing boundaries. Liberals were unsurprisingly not that thrilled at the time. It is not practicable for the Commission to draw a set of districts which can be guaranteed to generate a fair election outcome at a subsequent election. It is practicable for the Commission to draw a set of districts which will provide a level playing field for electoral competition at a subsequent election, minimizing any advantage to either party and ensuring the existence of marginal districts which can respond where voter sentiment changes. As many of the seats held by Labor were marginal, little would have been required for an effective campaign to influence the final result. Translating, they said that the Liberals lost because they didn’t campaign hard enough in the right seats. As Winston Churchill said, ”Democracy is the worst form of government, except for all those other forms that have been tried from time to time.” (from a House of Commons speech on Nov. 11, 1947). When you vote in an Australian election, you are not voting in an unfettered democracy where every vote can vote for everything. You are voting largely for one of two candidates who are put to you. If your community overwhelmingly votes for one party rather than the other, your vote is unlikely to make the difference. If your community is divided, your single vote could turn the election. …while there was an 8.4% swing against Labor state-wide, the swing was heavily concentrated in Labor’s safest seats. There was an 11.0% swing against Labor in seats with Labor margins of more than 10%, but only 2.0% in seats with Labor margins under 6%. Labor ‘sandbagged’ its marginal seats, lost votes in its safe seats but retained support in seats it needed to hold to stay in office. The raw average swing is 0.52% to the Liberals. In the three Independent seats, the swings were strong. Frome swung 1.5% to Labor; and Fisher and Mount Gambier both swung around 7% to the Liberals. First the elephant stamps for over achievers. Five held Liberal seats got swings to them above the State average: Dan Van Holst Pellekaan in Stuart (11.4), John Gardiner in Morialta (6.4), Peter Treloar Flinders (3.4), Duncan McFetridge in Morphett (2.2) and Michael Pengilly in Finniss (1.8). Great local campaigning but head office should be considering any dollar spent there a waste. (Oh except the Legislative Council campaign but we’ll see about that later). Michael Atkinson (ALP) continues to be a remarkable campaigner. Despite a state average swing of at least half a percent to the Liberals, the swing in his electorate was 4.2% towards him. ALP Head Office gives him tuppence, by the way. You’ve also got to hand it to Steph Key (ALP) (1.6% towards her); Zoe Bettison (ALP, 1.2% towards her – a brilliant first time effort) and Leon Bignell (1.1% towards him – and he did well last election too). Taylor (veteran hard worker Leesa Vlahos), Elder (first timer, Annabel Digance), Kaurna (first timer, Chris Picton), Enfield, Reynell (first timer, Katrine Hildyard), West Torrens (veteran campaigner extraordinaire, Tom Koutsantonis) and Florey (veteran energetic local, Frances Bedford) all held back the State tide. In the seats where it mattered (ie Labor held marginals), the Liberals did do better than the state average but not ‘better enough’ and not in the right places. In Ashford, they needed only a 0.6% swing to win but they got a 1.6 against them. In Elder, they needed a 2% swing to win (eminently achievable since they got over 3% in Bright) but they only got 0.1% towards them. The votes in the Independents’ seats, definitely play a role in affecting the state average since they are two of the highest swings to the Liberals. But it’s not swings or total statewide votes that matter: it’s winning enough seats. Both parties know that. Even if they lose, you’d have to say it’s looking like Labor campaigned locally better. Of course it’s early days and these numbers will change with postals enormously but you’d rather be in Labor’s shoes this morning than the Liberals. Ultimately, the Liberals need to take a good hard look at their campaigning techniques.